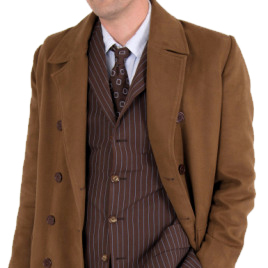 I'm a big fan of the design in New Who, and Magnoli's copy of this coat takes the biscuit. It is a lot less heavy/bulky than I'd imagined, but looking again at reference pictures, I think Magnoli Clothiers got it bang on. There's a lot of 'swoosh' to this, so this coat sort of follows you around, looking marvelous :-) . Easily one of the best things in my wardrobe, and far superior to other versions of this style overcoat I've seen. Top marks.